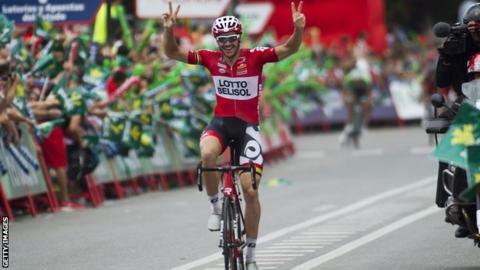 Australia's Adam Hansen won the 19th stage of the Vuelta a Espana as Alberto Contador maintained the overall lead from Great Britain's Chris Froome. Hansen, 33, led with 4km to go and held off the peloton to win by four seconds from German John Degenkolb, with Italy's Filippo Pozzato third. Spain's Alejandro Valverde is third overall, 13 seconds further back. As the pack hit the final difficulty of the stage, a 4.7km long category two climb, Astana's Alexey Lutsenko attacked. Meanwhile, Team Sky's Italian rider Dario Cataldo withdrew on medical advice with head and shoulder injuries, after crashing on the descent of the Alto Monte Faro. Saturday's 20th stage is a 185.7km ride from Santo Estevo de Ribas de Sil to Puerto de Ancares. 2. John Degenkolb (Germany / Giant) +5"
3. Filippo Pozzato (Italy / Lampre) +5"
4. Yannick Martinez (France / Europcar) +5"
5. Michael Matthews (Australia / Orica) +5"
6. Geoffrey Soupe (France /FDJ.fr) +5"
7. Paul Martens (Germany /Belkin) +5"
8. Jasper Stuyven (Belgium /Trek) +5"
9. Romain Hardy (France /Cofidis) +5"
10. Damiano Caruso (Italy /Cannondale) +5"
2. Chris Froome (GB/Team Sky) +1:19"
3. Alejandro Valverde (Spa/Movistar) +1:32"
4. Joaquim Rodriguez (Spa/Katusha) +2:29"
5. Fabio Aru (Ita/Astana) +3:15"
6. Daniel Martin (Ire/Garmin) +6:52"
7. Samuel Sanchez (Spa/BMC Racing) +6:59"
8. Warren Barguil (Fra/Giant) +9:12"
9. Daniel Navarro (Spa/Cofidis) +9:44"
10. Damiano Caruso (Ita/Cannondale) +9:45"